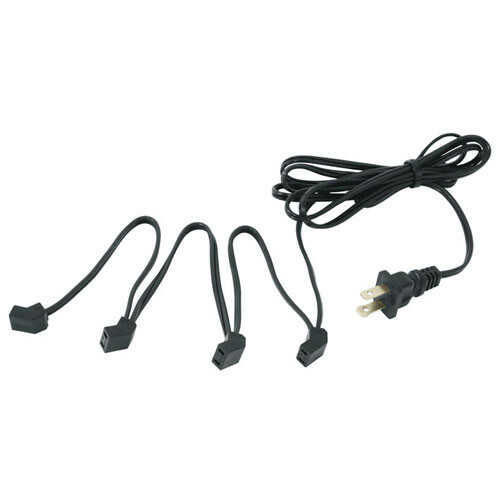 The FANCORD-4X1 Multiple Fan Power Cord (4 Fans) from Middle Atlantic is a special extension cord designed to power multiple fans from one power connection. The unit consists of a series of outlet plugs strung along a power cord. Simply plug the fans in the outlets and connect the power connector to the electric outlet. All of your fans will then receive power from one connection. The cord is UL listed and CSA certified. This model will power up to four fans. Note: A fan cord is not required for Middle Atlantic integrated fan tops. This special extension cord is designed to power multiple fans from one power connection. Power This unit is compatible with all Middle Atlantic fans. Box Dimensions (LxWxH) 4.7 x 3.2 x 1.3"